A group calling itself “The Script Kiddies” hacked USA Today’s Twitter account this weekend and used it to solicit requests for future targets and even to promote its own Facebook page. Although this recent hack seems like more of a childish prank, this group is being taken seriously by the FBI due to its earlier hacks involving false terrorism claims posted to NBC’s Twitter account. USA Today quickly regained control of the compromised feed. 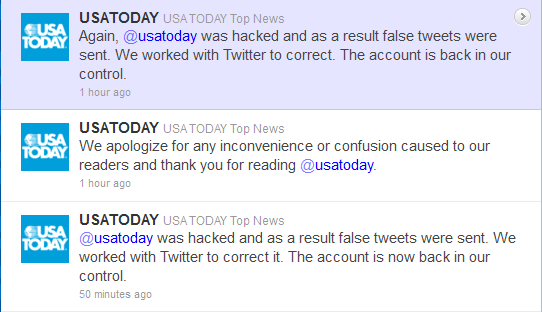 "@usatoday was hacked and as a result false tweets were sent. We worked with Twitter to correct it. The account is now back in our control," it said. "We apologize for any inconvenience or confusion caused to our readers and thank you for reading @usatoday." It’s possible that the new USA Today hack involved a spyware Trojan horse, like the earlier NBC hack did. For the NBC hack, NBC News’s director of social media Ryan Osborn could have received a Trojan horse containing a keylogger via email, which then captured passwords as they were typed into his computer. The Facebook page allegedly operated by the Script Kiddies is still live, but their @script_kiddiez_ Twitter feed has been suspended.